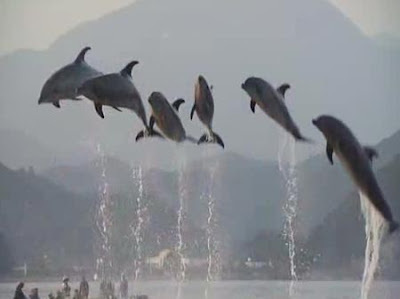 The Cove is a hard-hitting documentary film about the capture and killing of dolphins in Japan. The particular focus is a “killing” cove near the small coastal town of Taiji, where thousands or dolphins are slaughtered every year. The “star” of the film is Richard O’Barry, who originally trained the dolphins for the Flipper TV series some forty-five years ago. He began to regret the way dolphins were treated by humans, though, and for the past thirty-five years has been carrying on an individual crusade for the welfare of dolphins. Throughout the film, this single-minded campaigner is cast as the eloquent spokesman for all those who believe that the slaughter of dolphins is unconscionable. It first identifies Taiji, Japan, as the rather sinister home of a secretive industry that is out to kill dolphins on a massive scale. Since there has been public outcry against the brutal slaughter of dolphins, they don’t want reporters or photographers to come there and report on what goes on. The general process is known, however. Fishing boats line up in the water near a pod of dolphins and antagonize their sensitive acoustic sensor organs by extending steel poles into the water and pounding on them with hammers to make irritating noises. They then herd the agitated dolphins into the narrow cove, seal it off with nets, and then begin to capture and slaughter them. Captured bottle-nose dolphins can be sold live to public aquaria and water parks around the world for up to $150,000. Dolphins of other species are slaughtered for their meat. 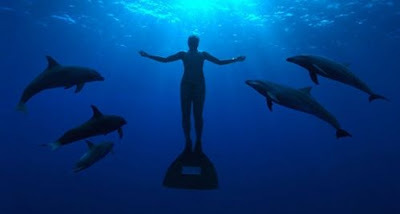 The high-level intelligence and consciousness of cetaceans, in general, and dolphins, in particular is discussed, with interviews of those who have had close, friendly interactions with dolphins in the water. The film crew is shown attempting a secret nighttime mission to sneak into the killing cove and find out what happens. The whole thing is presented as a military-style “special ops” mission, as if it were undertaken by a SWAT team against brutal e nemy forces. The mission is interrupted and aborted, however, by Japanese security personnel who spot the interlopers. There is a presentation about the degree to which dolphin meat is contaminated with heavy metals, particularly mercury. Because dolphins are high up on the food chain, mercury pollutants in the ocean accumulate as they are passed up the food chain. Dolphins often have more than ten times the “safe” level of mercury content (note: there is no real safe level of mercury ingestion, this specified levels are essentially rough guesses). A second “special ops” mission is conducted to plant hidden surveillance cameras in the hills around the killing cove. This is shown with live nighttime camera footage, and the soundtrack features lots of “roger that” and “copy that” communication among the commandoes. With the secret camera in place, they are able to get footage of the bloody dolphin slaughter that the Taiji industrial people want to keep from the public. The final section of the film includes more discussion concerning the stubbornness of the Japanese government and the insidious way they have manipulated the International Waling Commission by padding the membership with “bought” proxies. It concludes with a visual reminder of O’Barry's heroic campaign. The Cove is a moving and skillfully made film about the callous way that innocent sea mammals are treated by the human seafood industry, and it is worth seeing by everyone. Anyone who sees the film, though, should probably contemplate some larger issues that are implicit in the film. The Japanese fishermen feel that Western concern for the killing of cetaceans is simply a cultural prejudice. “You eat cows, and we eat whales,” they say, and that is certainly correct. In The Cove, there is a strenuous effort made by the producers to emphasize that dolphins are so self-aware – they are “almost” human. They are almost like us, so it is inhuman for us to confine them in aquaria and kill them. But it is pure hypocrisy for us to claim that we are more human, when we kill and eat other sentient beings. Anyone who has looked into a dog’s eyes can see the returned look of a conscious being. Why should we be so thoughtlessly killing and eating obviously conscious animals, such as cows, sheep, and pigs? I urge all readers to view the video Meet Your Meat – or try here, in order to see the way our meat industry slaughters animals. The Cove goes on to make the argument that the dolphins are slaughtered in a cruel fashion and shows pictures of how the dolphins throats are slit by the Japanese fishermen. The Japanese government has, however, introduced procedures to make the killing of dolphins more painless. But just how “humane” is it to kill innocent animals in a relatively painles s way? Should we feel satisfied with painless killing? 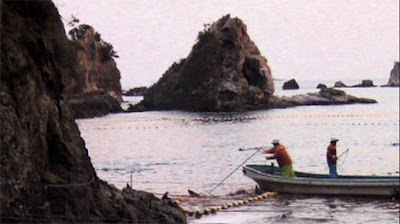 The Cove makes the further argument that the Japanese real material concern is that existing cetaceans are competing with their fishermen for the harvesting of fish – the Japanese want to reduce these competitors from the waters, so that they can catch and eat more fish. It is increasingly clear, though, that the current worldwide human consumption of fish is unsustainable, irrespective of how much the cetaceans eat. In fact in the interests of our physical health, our global survivability, and our ethical well-being, it would be best if we reconsider and renounce the entire enterprise of killing animals of any kind. Maybe if you see this film, you will be one step closer to that beautiful decision.